MONTREAL—As many as 80,000 protesters hit the streets of Montreal on July 22, proof that the mass struggle over the Liberal government`s unilateral decision to raise university tuition fees has far from dissipated. The central slogan this time was “Out with the Neo-Liberal Parties,” reflecting the growing radicalization produced by the struggle and the influence of the CLASSE (Coalition large de l’association pour une solidarité syndical étudiante/ Broad Coalition of the Association for Union Student Solidarity), the largest and most militant of the student unions participating in the strike. It is true that the numbers this time were down compared to the mass demonstrations of March 22, April 22, and May 22, each of which attracted 200,000 or more. But this is mid-summer during the annual construction holiday, and many students have dispersed to their homes outside of Montreal or are working. The student strike has been effectively suspended since June when the government cancelled the spring academic session and brought in a special repressive law to limit demonstrations, ban pickets, force professors to teach, and levy heavy fines for defiant organizations and individuals. With this draconian legislation, the government hopes to break the strike and cripple the student associations when classes resume in August. A major complication affecting the mass movement is the provincial election that Liberal Prime Minister Jean Charest set for Sept. 4. The Liberals hope to capitalize on a backlash against the striking students. On the anti-government side, there is considerable pressure to close ranks behind the Parti Quebecois (PQ) in order to oust the hated Liberals. For its part, Quebec Solidaire (QS), the small left party (with one seat in the National Assembly) that was forthright in its support for the students’ strike, hopes to head off the logic of the strategic vote, since it competes for the same working-class and popular electorate as the PQ. The CLASSE will retain its independence from the political parties, but plans a parallel election campaign across Quebec to share its societal project with the population. Direct democracy, social justice, defense of the environment and gender equality will be counterposed to the existing neo-liberal political and economic order and the rule of the 1%. The CLASSE is currently committed to pursuing the strike against higher tuition fees but will be holding urgent general assemblies of its members to discuss this vital question in the context of Bill 78 and the anticipated election campaign. The militant stance of the CLASSE clearly anticipates a long-term struggle without neglecting the electoral arena. This is a positive aspect of its position even if there is silence or vagueness on other strategic questions such as how to mobilize the labour movement in the presence of a class-collaborationist labour leadership or the centrality of the national question for an anti-capitalist perspective in Quebec. The same shortcomings apply to a broad section of the Quebec left, including Quebec Solidaire. The situation coming into this election is contradictory: On one hand, there is a social struggle of unprecedented depth and militancy, even if so far it has been unable to break the back of ruling-class intransigence. On the other, there is an opportunity to toss out a hated government, which is making a bid for a third mandate in order to continue its austerity drive. Polls indicate a close race between the Liberals and the Parti Quebecois, with the Coalition Avenir Quebec (CAC) somewhat further back, perhaps resulting in a minority Liberal or PQ government. This uncertain scenario reinforces the argument to consolidate the anti-Liberal vote behind the PQ. The argument for a tactical vote for the Parti Quebecois must be rejected. This party differentiates itself from the Liberals primarily on the national question, but in reality follows the dictates of international capital and is incapable of leading a struggle for national liberation. Its record in office is that of a co-implementer of neo-liberal policies. The pressure for a “useful” PQ vote is analogous to arguments for lesser-evil pro-Democratic Party politics in the U.S. The Coalition Avenir Quebec (CAC) represents a right-wing split from the PQ, favouring further retreat in the struggle for national independence, union-bashing policies, and acting as an incubator for all manner of reactionary pro-market schemes that would accelerate the degradation of social life in Quebec. Despite the weaknesses of its programme and leadership, QS offers the only option in this election. Its origins lie in a break with the neo-liberal consensus embracing the other parties, and in practice it aligns itself with mass struggles. At the same time, we favour continued mobilization in the streets in order to apply maximum pressure during and after an election campaign. 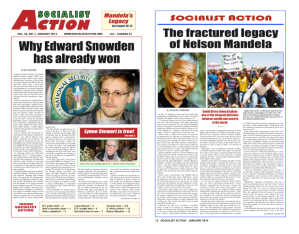 Viewpoints in this article are those of Socialist Action /Ligue pour l’Action Socialiste in the Canadian state, and do not reflect those of Socialist Action newspaper. ← Will Enbridge spills kill XL and Gateway pipelines?